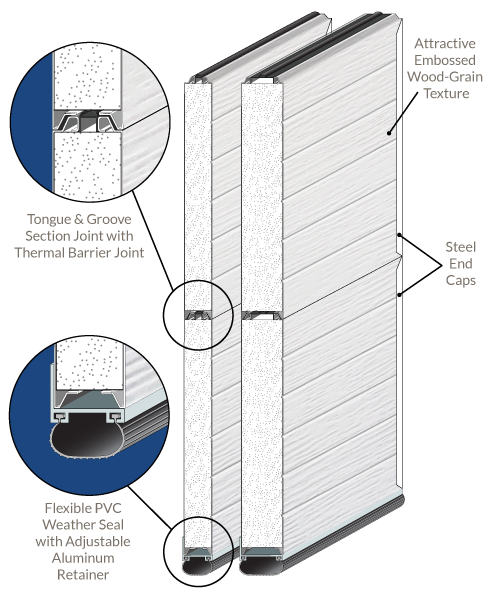 The Therma Series Commercial/Industrial insulated steel garage doors are rugged and beautiful. They are designed to have a sleek and appealing appearance with great weather resistance. Therma Series doors are made with a sandwich type construction, steel outer skins are formed and then pressure bonded to a polystyrene core giving the door maximum strength, a natural Therma Break and superior insulating efficiencies. Three insulating values are available – R10.4, R12, and R16. Now available in 24 gauge steel face. 15″ radius torsion hardware; track is 2″ hemmed and bracket mounted. 3″ track supplied when required by weight. Heavy duty steel rollers, non corrosive door fixtures and 14 gauge graduated hinges are standard. Double end hinges and long stem rollers are included on doors as required by width and weight. U-shaped galvanized struts are supplied as required by width and weight to keep the door rigid. All doors are standard with interior slide bolt lock.